The slide shows are full of masks these days. January is the beginning of both the Chinese new year and Carnival time around the globe, not to mention various religious holidays, civic anniversaries, and assorted other excuses for parades, fireworks, dancing, and mummers galore. Factor in a sag in the news cycle and you get more than the usual number of colorful images. I’ve picked out two that seemed more artful than the standard fare. The caption identifies the artist as Chen Ting, a Beijing opera performer from the Jiangsu Art Group. You can see a more direct view of the made up face at The Big Picture, but this photo adds a reflective dimension better suited to highlighting the theatrical artistry on display. The double image mirrors the fact that the makeup doubles the face. Similarly, the explicit artifice in the photograph suggests that the makeup is not merely enhancing nature but rather creating a mask. The point, after all, is to depict something larger than a single person. We can see the difference between actor and character only because the camera has taken us backstage. 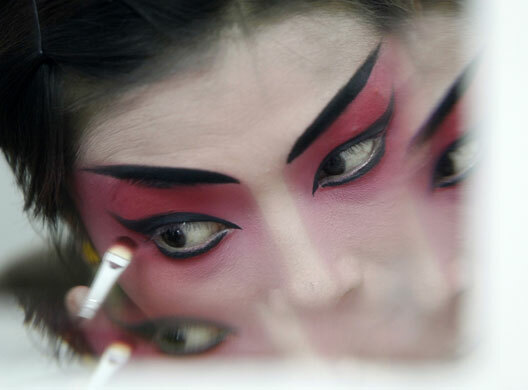 Once the makeup is applied and brush and mirror have been put away, artifice and nature will have become fused into a third thing, the facial mask of the living character in the play. The backstage shot reminds us that there is machinery behind enchantment. It may be as simple as a brush, some paint, and a mirror, but the mythical creation is a product of methodical craft. We are easily enchanted nonetheless, and so it is that many of the other photographs of the season feature spectacular sets, shows, and performances. Perhaps that’s why I found this next photograph absolutely endearing. 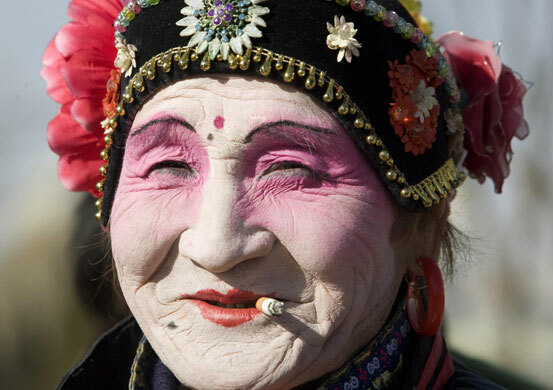 The caption reads, “A performer smokes a cigarette during a show to celebrate the Chinese lunar new year.” No news there. I wonder, though, if she is on stage; I doubt it, and so this would be another backstage shot. There is another similarity, as she, too, has reddish makeup under black eyebrows. But that’s it. This performer is old rather than young, adorned in folk costume instead of artiste simplicity, grinning while taking a break rather than tightly focused, and she’s got a lot of miles on her. And one more thing: she’s beautiful. She’s beautiful because of that wonderful smile, and her enjoyment of the cigarette, sun, and whatever else has caught her fancy, and because, despite her age and those lines and creases that can’t be hidden by any makeup, she’s still getting up on the boards and living her life in the theater. And so we see another way that art and life merge. Instead of conforming her face to the mask, her mask has changed with her face. We see neither actor nor character but instead a real person. Someone whose facial mask has become the familiar expression of who they are. This is the better art: it doesn’t enchant, and settles instead for showing us a real face, one much like all the others that we could see but ignore. Photographs by Darrin Zammit Lupi/Reuters, Christina Hu/Reuters.